So I invited my friend to lunch and decided to cook something simple, tasty but satisfying. 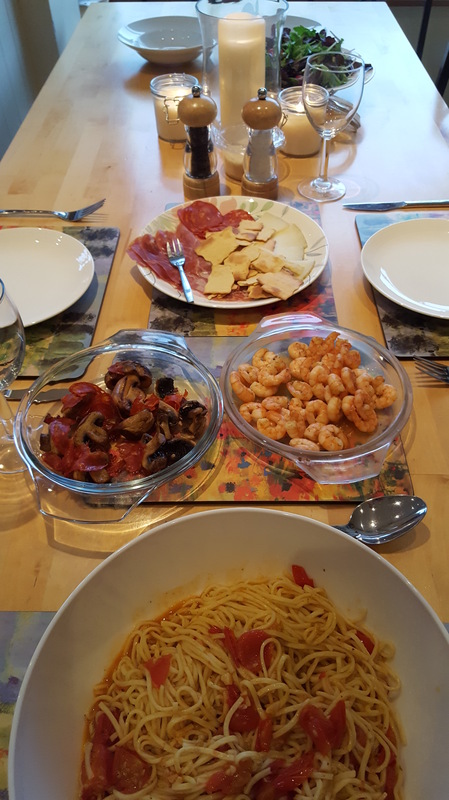 As we had such a much needed, uplifting day, thought I’d blog about it..
Somebody very important in my life suggested fresh spaghetti with a cherry tomato sauce. Fantastic, I thought. Means I can add a few side dishes like mushrooms with chorizo and fried, fresh prawns followed by a fruit crumble pudding. Started with the fruit crumble by throwing some berries in a dish and making the crumble. Just lard and butter rubbed into the flour plus sugar. Simple and quick and the ice cream that was languishing in the freezer, just waiting to be thrown down my throat, accompanied the pud. 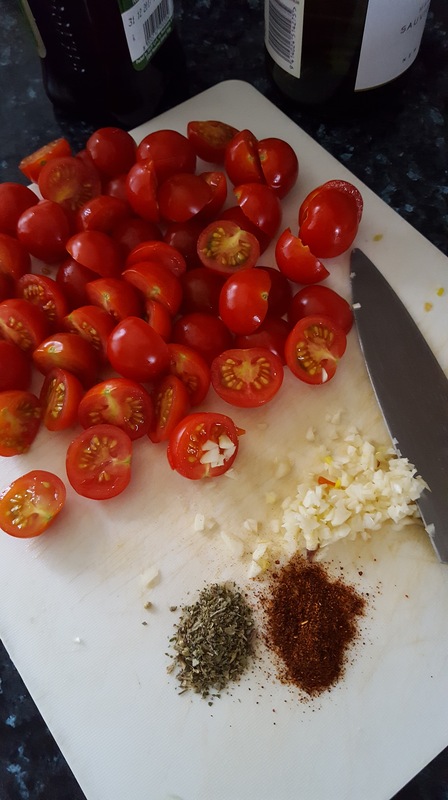 Next I chopped tomatoes up with garlic, herbs and chilli. Measured out the wine. Oh yes. Fried the garlic in 3 tablespoons of olive oil then added herbs and chilli. Added toms (2 mins) then splashed in the wine and enjoyed the exquisite smell that permeated the kitchen. Oh, and I put some cool, jazzy, funky tunes on. Fried my chestnut mushrooms in butter with chorizo and left ready. Same with the grey prawns that rapidly turned pink. Sooo magical. Put some chips, manchego cheese and serano ham on the starter plate and was ready to roll. Well lay the table anyway. Sorted the table, tidied and cleaned up, lit candles and waited a few minutes for my friend. Cherry Tomato Spaghetti- Fresh spaghetti, 1 lb top quality cherry toms, garlic, chilli, herbs and wine. Add: Chorizo, mushrooms and/or prawns, as I did. Pud – Mixed fruit and crumble (1oz butter, 1oz lard, 4oz plain flour) mixed berries and sugar on top.